f you are searching “what is the longevity of my septic tank system?” this post should send you in the right direction! Septic systems are an extremely common way to store waste in residential areas. The reason for their prevalence is the fact that they are effective while needing minimal maintenance to remain so. While owning a septic tank is easy, having proper knowledge about it will help you avoid any issues that have been experienced by unfortunate septic tank owners. One important piece of information that you should know is the life expectancy of your septic tank. While most tanks last for about the same amount of time, there are variables that can effect the life span of your septic system. One of the main factors that will figure into how long your septic tank will last is the material that it is made out of. Steel septic tanks have been shown to last for an average of 25-30 years. This is a good amount of time, but if they aren’t maintained properly they may fail, causing you to experience the nightmare of septic tank issues. When a septic tank leaks into your yard, your property becomes a hazard zone and the waste that seeps into your property will cause an unpleasant odor to waft through the air. Concrete septic tank systems last much longer than steel systems to the tune of 40+ years! If you purchase a home with an already existing septic system, finding out when it was installed is a very important piece of information to obtain. Aside from the material that was used to construct your septic tank there are environmental factors that will also play into how long your specific septic system will last. If your septic tank is installed near tree roots it’s days of being effective may be numbered. Tree roots can puncture your septic tank as they expand, which will cause the contents of your septic tank to leak into your yard. Another factor that can greatly effect your septic system is the ground water in the area. If the ground water level is high, it could affect the drainage of your tank and how long it will remain effective. A-American Septic Service can help you if you have any septic tank related questions in Phoenix. 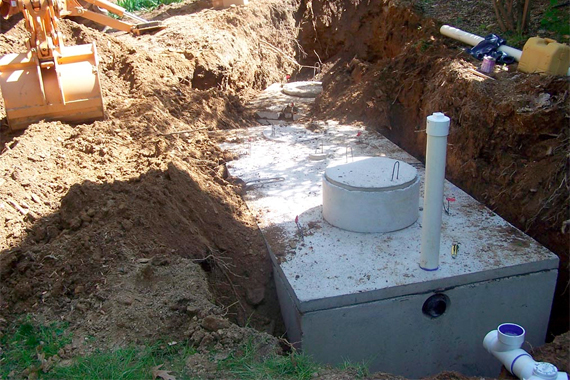 We can cover anything from septic maintenance and repair to total septic tank replacement. Call us today at 602-254-5448!